GPI TM050 Turbine Water Meter is an ideal alternative to the traditional water meter. Calibrated in gallons and litres with 1/2" fitting size. It delivers from 1 to 10 GPM. Sturdy construction with easy access to internal parts. GPI TM050-N Digital PVC Water Meter is an ideal alternative to traditional water meter. Calibrated in gallons and litres with 1/2" NPT. It delivers from 1 to 10 GPM. Lightweight and durable construction with easy access to internal parts. GPI TM075 Turbine Digital Water Meter is an ideal alternative to traditional water meter. Calibrated in gallons and litres with 3/4" fitting size. It delivers from 2 to 20 GPM. Sturdy construction with easy access to internal parts. GPI TM075-N Digital PVC Water Meter is an ideal alternative to traditional water meter. Calibrated in gallons and litres with 3/4" NPT. It delivers from 2 to 20 GPM. Lightweight and durable construction with easy access to internal parts. GPI TM100 Turbine Digital Water Meter is an economical alternative to other types of water meters. Calibrated in gallons and litres with 1" fitting size. It delivers from 5 to 50 GPM. Sturdy Construction with easy access to internal parts. GPI TM100-N Digital PVC Water Meter is an ideal alternative to traditional water meter. Calibrated in gallons and litres with 1" NPT fitting size. It delivers from 5 to 50 GPM. Lightweight and durable construction with easy access to internal parts. 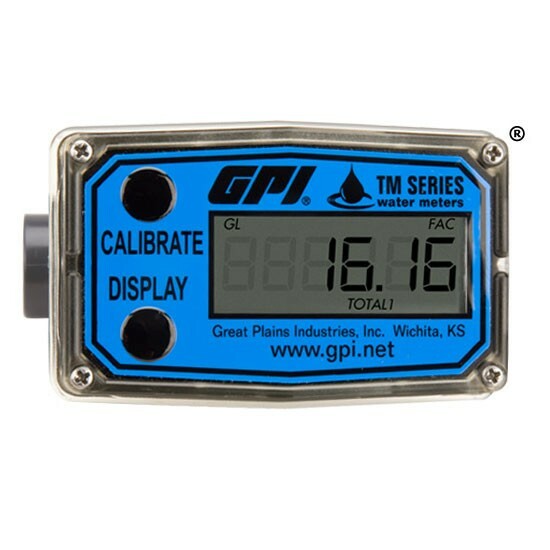 GPI TM150 Turbine Digital Water Meter is an ideal alternative to traditional water meter. Calibrated in gallons and litres with 1 1/2" fitting size. It delivers from 10 to 100 GPM. Sturdy Construction with easy access to internal parts. GPI TM150-N Digital PVC Water Meter is an ideal alternative to traditional water meter. Calibrated in gallons and litres with 1 1/2" NPT. It delivers from 10 to 100 GPM. Lightweight and durable construction with easy access to internal parts. GPI TM200 Turbine Water Meter is an ideal alternative to traditional water meters. Calibrated in gallons and litres with 2" fitting size. Delivers from 20 to 200 GPM. Sturdy Construction with easy access to internal parts. GPI TM200-N Digital PVC Water Meter is an ideal alternative to traditional water meters. Calibrated in gallons and litres with 2" NPT. It delivers from 20 to 200 GPM. Lightweight and durable construction with easy access to internal parts. GPI TM300 Turbine Water Meter is an ideal alternative to traditional water meters. Calibrated in gallons and litres with 3" fitting size. It delivers from 40 to 400 GPM. Sturdy Construction with easy access to internal parts. 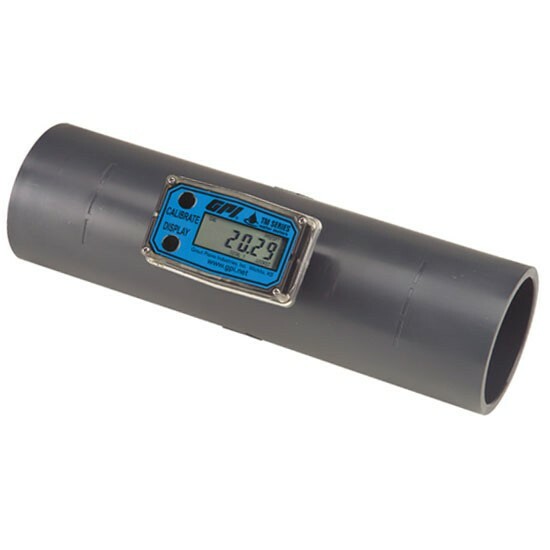 GPI TM300-N Digital PVC Water Flow Meter is an ideal alternative to traditional water meters. Calibrated in gallons and litres with 3" NPT. It delivers from 40 to 400 GPM. Lightweight and durable construction with easy access to internal parts. GPI TM400 Turbine Digital Water Flow Meter is an ideal alternative to traditional water meters. Calibrated in gallons and litres with 4" fitting size. It delivers from 60 to 600 GPM. Sturdy Construction with easy access to internal parts. GPI TM400-N Digital PVC Water Meter is an ideal alternative to traditional water meters. Calibrated in gallons and litres with 4" NPT fitting size. It delivers from 60 to 600 GPM. Lightweight and durable construction with easy access to internal parts.